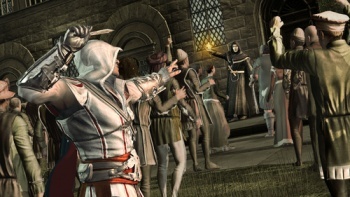 The second Assassin's Creed II DLC, Bonfire of the Vanities, will continue Ezio Auditore di Firenze's adventures this Thursday, February 18th. Last year's Assassin's Creed II was good - really, really good - but that hasn't stopped Ubisoft from trying to make it better by releasing content that didn't make it into the final game (for whatever reason) as DLC. Last month, Ezio's adventures continued with The Battle of Forli, and now, Ubisoft has announced that DLC #2 - Bonfire of the Vanities - will be out this week. Bonfire of the Vanities (which is based on historical events, as is par for the series) will be hitting PSN and Xbox Live this Thursday the 18th, according to the official Ubisoft Twitter feed, and Ubisoft's Christophe Grandjean posted some new screenshots from the upcoming update. In Bonfire of the Vanities, Ezio returns to Florence to aid Machiavelli (yes, that Machiavelli) in freeing the city from the influence of a crazy, corrupt monk named Savonarola. Call me crazy, but I can't help but feel that freeing the city from Savonarola's grasp will be largely accomplished by stabbing fools in the face. That's just going out there on a limb, though. This is the second of the two DLC packs initially announced by Ubisoft. Whether they'll leave AC2 at this and move on to developing the next game in the series, or just come up with more DLC is anyone's guess. As for PC users, you'll get Bonfire of the Vanities plus Battle of Forli included when the PC version of Assassin's Creed II ships on March 16th.